What Paypal Triggers and Actions are Supported? Refunded Sale - Only refunded payments trigger this. Successful Sale - Only successfully completed payments trigger this (with line item support). Successful Sale - Only successfully completed payments trigger this. All Merchant Transactions - All Merchant Transactions, regardless of status, trigger this. Instant Payment Notifications or IPNs send instant notifications of new PayPal transactions to Zapier through Webhooks. You can think of a Webhook as a message sent from one web application to another delivering some kind of data. Zapier uses webhooks to capture new PayPal transactions through PayPal's IPN feature. 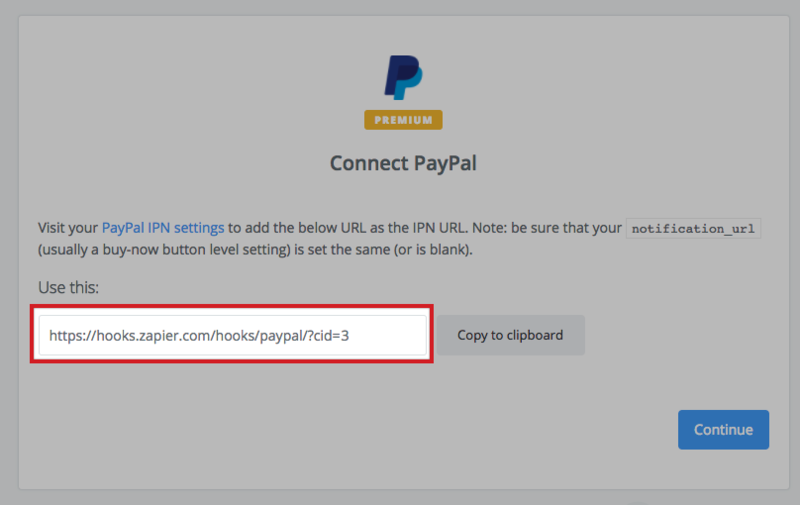 PayPal only allows you to set one IPN URL (aka “Webhook URL”). 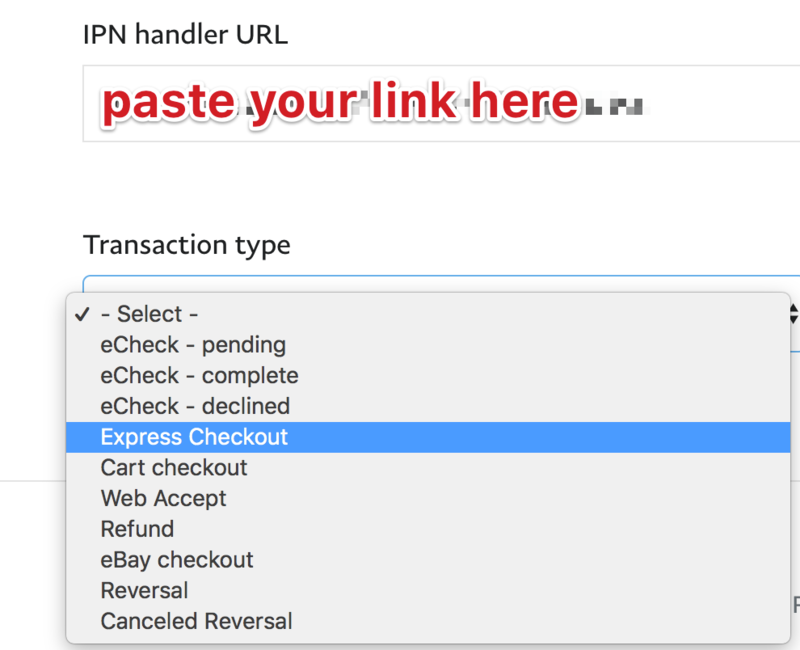 This works out fine if Zapier is the only service you need to send new orders to, but if you use an e-commerce plugin or other service that requires the use of IPN, you’ll find that the IPN URL is already set to that plugin/tool’s URL. Before going this route, you should check the Zapbook to see if Zapier supports the e-commerce tool you're currently using. If it does, you may be able to skip this workaround. If you’d like to use Zapier along with your existing tools, you need to send notifications to more than one URL. Thankfully, Zapier can help you get this done! We don’t currently use the IPN authentication protocol to verify the webhook received from PayPal. If you wish to do that, you have to implement it in your Zap as a follow-up step. 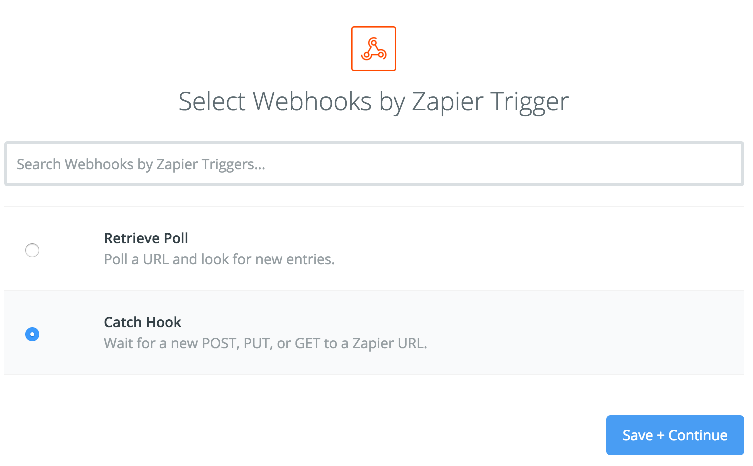 Using Zapier you can setup any number of PayPal to Webhook Zaps. 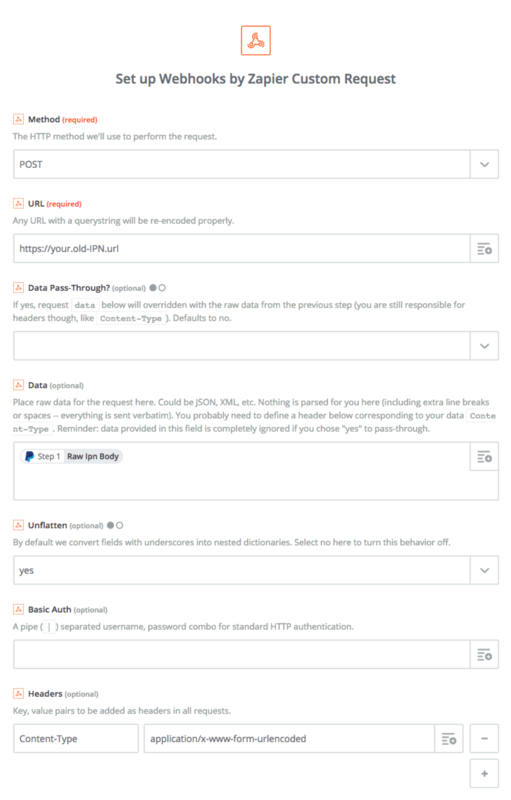 Zapier serves as an amplification mechanism for as many IPN URLs as you need as we can forward your IPNs. To get started, create a Zap and choose PayPal as your trigger app. Select “Successful Sale” as the action. Paste this into your PayPal IPN settings. 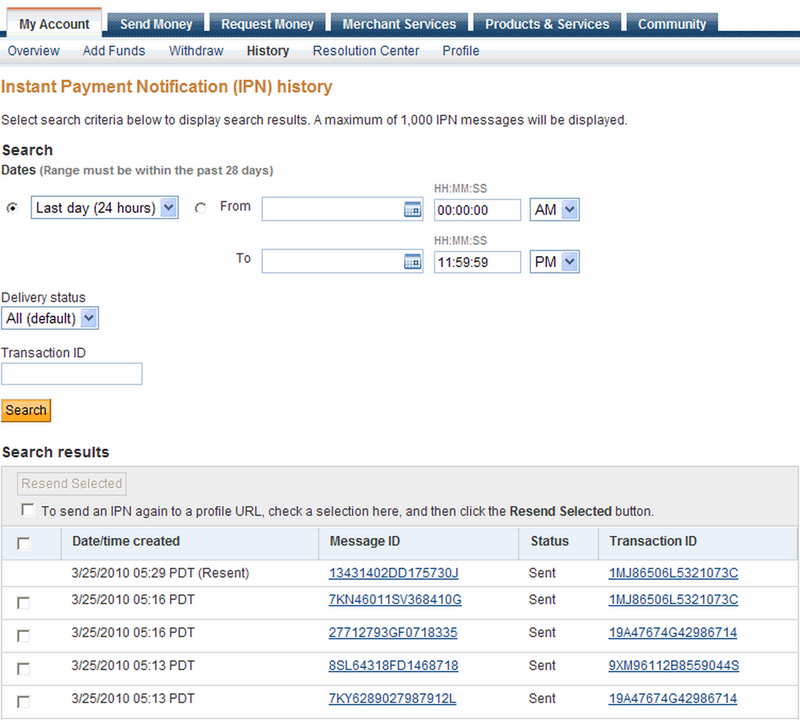 You can access your PayPal IPN settings here. 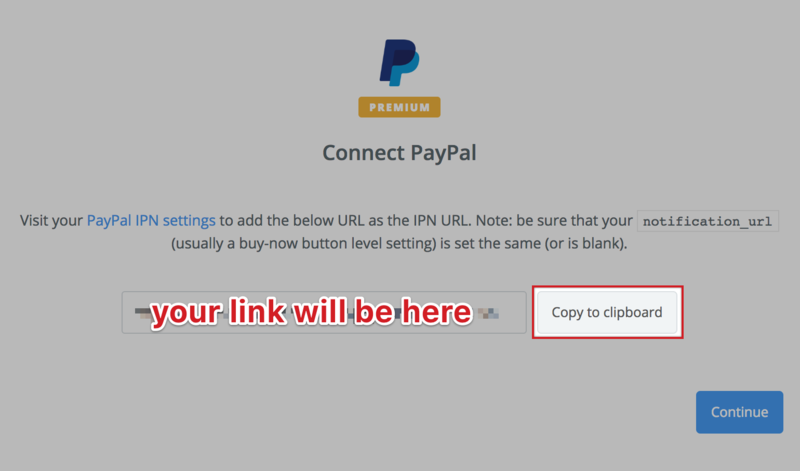 Make sure to save the old IPN URL that you are currently using at PayPal. Test the trigger in the Zap editor. Insert the "Raw IPN Body” in the Data field. Turn on your Zap. Now, your PayPal transactions will get sent to the URL you specified, but you can still set up as many other PayPal Zaps as you want to send that data to other apps as well. Note: If the plugin/service overrides Zapier's IPN URL in your PayPal account, you'll need to disable it to allow Zapier's URL to persist as the default IPN URL. If you get stuck setting this up or need any help, please don't hesitate to contact us. Remove the notification_url setting entirely from your button and let the PayPal settings be the default. Change the notification_url in your code to the Zapier IPN hook URL from Step 1 of your Zap. You can follow the above directions to ensure that each URL gets its notifications. And that's that! No code needed. Let us know if you need any help setting this up at all. 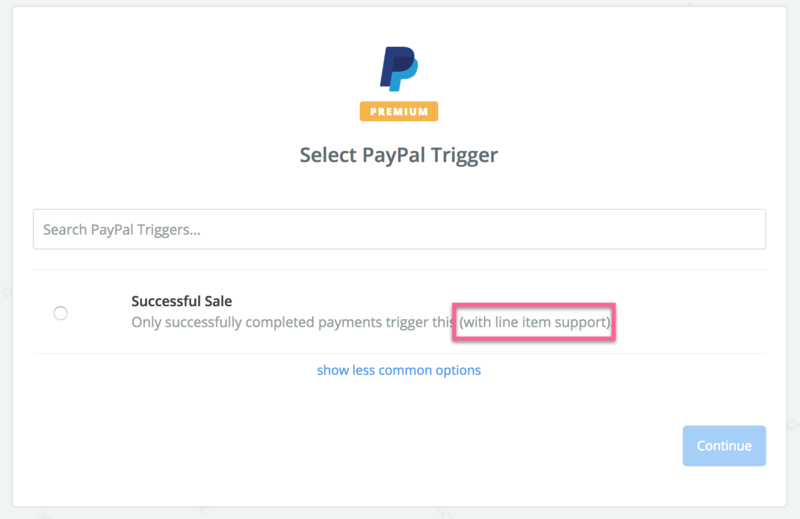 In Zapier's PayPal integration, the “New Successful Sale” trigger offers line item support. If you are using a PayPal button or a PayPal shopping cart script then you might have trouble. These things override the default IPN URL you set on paypal.com. The way to fix this is by following our "Multiple IPN" documentation here. You should notice a "Notification URL" listed above, it should point to Zapier. If it points somewhere else (like the screenshot above), you'll need to figure out what service or button is setting those URLs! If you have international customers via PayPal, or have noticed some addresses not coming through from PayPal, you may need to turn on UTF-8 encoding in PayPal. Otherwise, you may have some customer data come into Zapier as blank text, especially if it’s written in Russian or Cyrillic. To enable UTF-8 in PayPal, login to your PayPal account, then open the PayPal Language Encoding page (found here: https://www.paypal.com/cgi-bin/customerprofileweb?cmd=_profile-language-encoding) and click the More Options button. There, select UTF-8 from the Encoding options drop-down, and check the Yes toggle to have your PayPal data sent to Zapier using UTF-8 encoding. Save the changes, and within a day your PayPal settings should update. Zapier will now receive sale data from your PayPal account in any language, including Cyrillic characters. You can set up as many PayPal Zaps as you want, but they will always have the same URL found in the Set Up Webhook step, which means only 1 PayPal account can trigger them. If you have another PayPal account you want to get transactions from, create a Zap with a Web Hook "Catch Hook" trigger. 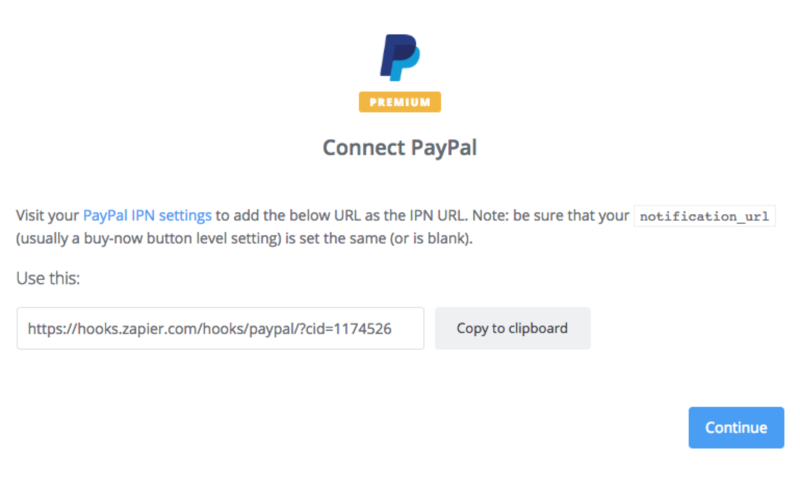 In the Set Up Webhook step, it will give a new URL, which you can use in your other PayPal account's IPN settings. Follow the setup instructions, here. There are times when the sample data from your PayPal Trigger, in the Zap Editor, will not match the live data that comes through when your Zap runs. This can be especially relevant if you’re trying to add a Filter step to only continue if the item sold contains specific text. 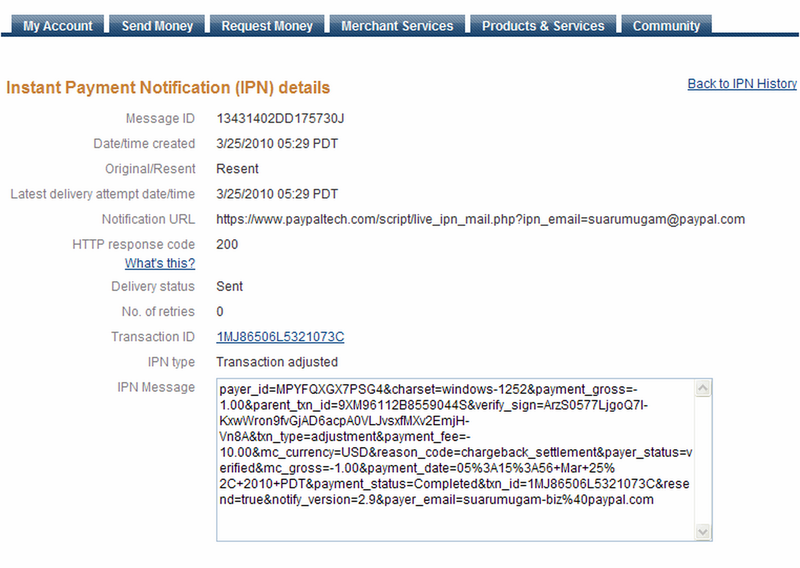 In order to get more accurate data, you can use PayPal’s IPN Simulator tool. NOTE: you will have to log in to your PayPal account in order to use the tool, but you do NOT need a developer account. You should be able to select Express Checkout or Cart Checkout to simulate a PayPal sale. Change the sample data before submitting, if you’d like. Back in the Zap Editor, test the Trigger step and you will now see what you sent from the IPN Simulator, instead of the default sample data we originally provide. Now you’ll have a sample that matches how those fields will appear when your Zap has been turned on and runs live. Check out this blog post on http://www.lovesdata.com/ by Benjamin Mangold to learn more about setting this up!